The disparity between the Eastern and Western conferences is so embarrassingly large that you must take it into account when evaluating a team’s ranking in any leaguewide stat. Eastern Conference teams will end having played 52 of their 82 games against their stinky conference brethren, meaning they will have faced a much less difficult schedule than a Western Conference playing the inverse slate of opponents. An East team that ranks eighth in points allowed per possession probably hasn’t been as stingy as a West team that ranks 11th. Schedule strength can skew things more at this stage, since teams have only played about 20 games. And so we come to perhaps the most surprising number of this young season: The Bobcats, a punch line for so long, rank third overall in points allowed per possession. Remember, these guys came in dead last in this category in both 2011-12 and last season; they were the worst defensive team in the league. Their only significant offseason acquisitions were a rookie big man who looks lost on both ends and a plodding veteran big with a charming self-awareness about his limitations as a defender. The Bobcats still can’t score, though they figure to get a boost from integrating Al Jefferson more completely after he went in and out of the lineup due to an ankle injury. But they’re 8-11, and if they can continue to defend at this level, who knows where they might finish in a conference where everyone but Indiana and Miami seems to be gunning for that brown “participation” ribbon? So what in the hell is going on in Charlotte? And can the Bobcats possibly keep this up? Charlotte has played six games against top-10 offenses, and they’ve hemorrhaged points at a bottom-five rate in four of those games: two losses to Miami, and blowout defeats in the first week of the season against Houston and New Orleans. Their 19-game résumé really has only two strong defensive performances: gutty recent losses against Phoenix and Dallas. Charlotte is going to regress defensively. There just isn’t enough talent here, especially at the point guard and big man positions, to sustain a top-five defense. I’d be surprised if they finished in the top 10, though all future outcomes seem possible when you look into the kaleidoscope of poop that is the Eastern Conference. But even league average would represent a massive and significant leap forward for a franchise badly in need of one, and the early-season returns suggest Charlotte has already laid the foundation for such a jump. Clifford has ditched Mike Dunlap’s helter-skelter schemes in favor of a simple, Thibodeauian/Van Gundyian formula his brainy players are executing with minimal mistakes. Step one is easy, and it’s something Clifford identified as his top priority when we chatted over the summer: Stop giving up points in transition. The Bobcats were a below-average team by every available measure of transition defense last season — opponent fast-break points, the percentage of opponent shots that came in transition, and others. 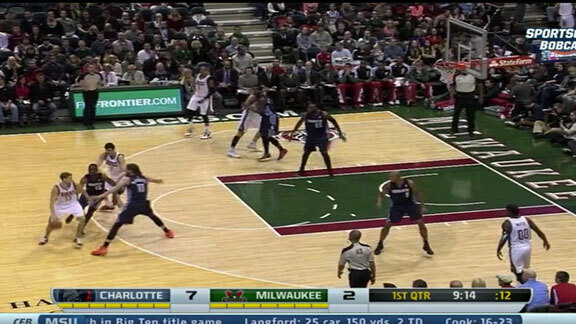 And, voilà, Charlotte has instantly transformed itself into arguably the best transition defense in the league. Only Indiana, wizards of transition defense under Frank Vogel, has allowed fewer fast-break points per game, according to NBA.com. Only 10.6 percent of Charlotte’s opponent possessions have been transition chances, per Synergy Sports, the lowest figure in the league. They’ve done this in part by punting the offensive glass, a trade-off Stan Van Gundy’s Magic teams made when Clifford was a lead assistant there. Charlotte’s floor balance is impeccable. Freeze the picture on your television when a Bobcat shot is in the air, and chances are pretty good two of Charlotte’s players will already be off the screen, having retreated beyond half-court. That is the product of a very simple rule, Clifford says: Of all Charlotte’s perimeter players, only one, Michael Kidd-Gilchrist, is allowed to pursue offensive rebounds. This is a nod to Kidd-Gilchrist’s athleticism, knack for anticipating angles, and slithery aggression. The same kind of caution rules on the other end, where Clifford has all five guys playing closer attention to the defensive glass. Charlotte ranks first in defensive rebounding percentage (tied with San Antonio) after finishing 29th last season and 27th the year before. Clifford signaled out Bismack Biyombo’s rebounding as an area of concern over the summer, and Biyombo is owning the defensive glass when he’s in the game; he’s grabbed 30.8 percent of opponent misses when on the floor, a mark that would have ranked third among all rotation players last season. (He still can’t do anything on offense, including catch a regulation NBA basketball when it is passed to him, but he can snare one when it caroms off the rim.) 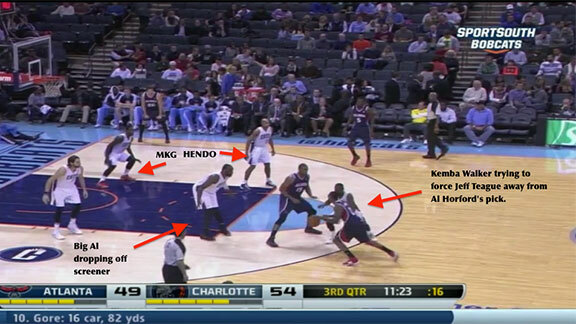 Kidd-Gilchrist is a plus on the boards, and Gerald Henderson has also chipped in more. Cody Zeller does a little bit of everything. The best-case scenario: Jeff Teague pulls up with nowhere to go, Jefferson returns to his original assignment, MKG and Henderson don’t have to stray too far from their guys, and the offense dies from there. Things are working, at least to some degree. About 31 percent of Charlotte opponent shots have been midrange jumpers, the worst shot in the game, per NBA.com; only four teams have coaxed a larger share of such dead-zone shots, and that group includes some predictable names — Chicago, Indiana, and San Antonio. The system has been friendly to Jefferson. Utah had him come out much further in help defense, and the big fella just doesn’t have the quicks or side-to-side agility to handle that kind of thing. He’ll never be a plus defender, but Clifford’s system hides his weaknesses. “I’ll tell you what,” Clifford says, his voice rising. “Everyone said he couldn’t defend. But he has been good for us, and he’s put a lot of work into it.” The Cats have actually been better defensively with Jefferson on the floor so far, and let’s be polite and just say that would be a reversal of career-long trends for Big Al. Indiana nails that best-case scenario often, and the Pacers can do so without having their own weak side wings step into the paint, as MKG and Henderson are preparing to do in the still above. Indiana’s overall talent level is such that the Pacers can defend without helping too much, or getting themselves into rotations. George Hill is an elite defensive point guard — fast, tough, and long. Paul George is even better as a pick-and-roll stopper. Roy Hibbert is such a beast at the rim that the Pacers aren’t scared of a little dribble penetration. The Bobcats don’t have that kind of talent, which is why they haven’t been as successful. Biyombo is their best rim protector, but he’s a mess defending out on the perimeter, and it’s hard to play such a limited offensive player for an extended time. Zeller’s all over the place, as most rookies are, and neither Jefferson nor McRoberts is a scary rim protector. Sessions is a career liability, and Walker is still just learning at the point of attack. “He’s light-years ahead of where he was last year,” Clifford says of Walker. But there is still much room to grow. Walker can relax into a flat-footed stance, leaving him unprepared to deal with quick changes of direction or sudden pick-and-rolls that emerge after some misdirection. He lunges and jumps to make up for his slow starts, and that kind of hopping leaves any point guard off-balance — prone to crossover dribbles. The result: Walker often runs smack into picks, or has to take circuitous routes around them. “It’s just about consistency for him now,” Clifford says. Opposing point guards get a nice head of steam, and given that advantage, they can get around Charlotte’s so-so big man helpers. From there, it’s drive-and-kick death. There’s a reason, Clifford says, the Bobcats’ weak spot so far has been defending the 3-pointer. “The majority of [the 3-point issues] come from problems on the ball, defending that first pick-and-roll,” he says. And now Charlotte’s top wing defender, MKG, is gone for several weeks with a broken hand. Gerald Henderson is solid, and though Jeffery Taylor looks solid, the team has been much worse defensively in each of the last two seasons with Taylor on the floor. The film gives no clear indication why this is, and Clifford isn’t sure, either. “The only thing he’s had a problem with is fouling,” Clifford says. There is slippage coming. But for the Bobcats to experience slippage, to have actually risen to a level from which it is possible to fall, is a major accomplishment — especially so soon in Clifford’s tenure. The coaching staff has introduced a clear scheme, and the players are executing it as best they can. They mostly show a very good understanding of opposing personnel; when you think a Charlotte perimeter player has overhelped, sinking too far into the paint from the outside, you rewind the tape and realize they’re guarding Shawn Marion, or Earl Clark, or some other non-shooter. The progress is profound.